Recently there has been an uptick in account hijacks on Twitter. This commonly happens when someone logs in with their twitter ID/Password to a site that is a trojan horse. That site then sends out messages through the victim’s account. Recently, it seems, a Direct Message is the preferred mode of sending out these messages. This adds the annoyance of not only a more direct message, but for many folks (myself included) DMs are the one type of message that goes directly to their phone. So now when someone you follow gets attacked, you run the risk of getting an early morning wake up call. This is a brief post to explain how to fix that. There are two approaches to fixing this. One is to set up your phone to not alert you of an SMS message during typical sleep time. As an Android phone owner, I use the program Locale to do just this. If you are interested in this application, read my review at The Gadgeteer. In this post I want to focus on a solution available to all Twitter users, regardless of phone. You probably have not spent a lot of time in your Twitter settings. The solution to this problem is right in the screen you used to set up the SMS alert in the first place. 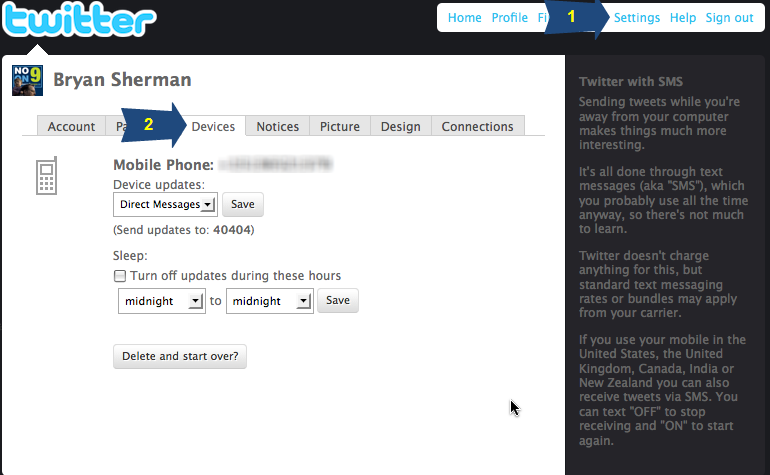 Log in to your Twitter Account on the web. No – No updates sent to this device. Yes – Every update in your twittstream goes to this device. Direct Messages – All direct messages go to this device. 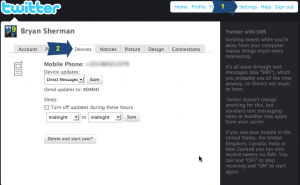 Now you will no longer receive SMS alerts during this time frame. A simple fix to an annoying problem.